My last step on Asian soil was at Tokyo’s Narita Airport. The week before I headed home, I was soaking up as much as I could of the Japanese culture, history, sake, and food. It wasn’t long into the wide-eyed lostness of trying to find my hostel that I noticed a grumble in my belly and a waft of ramen in the air. Soon, after an overly nice stranger dropped me off in front of my destination and helped me unload my bags, I began my search for food. I wandered back to the main drag and began scouring the store fronts and their ubiquitous plastic food displays. In between a convenience store and a sushi shop (that would have to wait for my next meal), I found sustenance in a beautiful bowl of ramen. Now, this wasn’t the freeze-dried block of tangled mess we all lived on in college. This ramen was delicately prepared, an orchestra of ingredients, and well worth the almost $9.00 USD I paid. Maybe the best money I spent in all of Japan. My little jaunt was nothing compared to the voyage by the NYT’s Frugal Traveler not long ago. For six days, the author fully immersed himself in nothing but Japanese ramen culture; roughly four bowls a day. He described the cuisine as, “handmade and artisanal, almost everything is fresh, from long-simmered broths and hand-cut noodles to pigs raised on red wine (for an inside-out marinade).” He relished in the apparent regional variations. 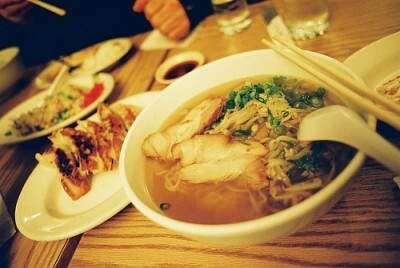 From a soy-enhanced chicken broth found on Japan’s main island of Honshu, to the more widespread pork bone broth from the southern island of Kyushu, or the garlicky, thicker noodled miso soup from Sapporo. He discovers the ramen culture as more of a craze, something akin to a New Yorker’s love of pizza combined with the south’s passion for barbecue. It’s so beloved, that the Shinyokohama Raumen Museum lists over 4,100 shops selling the noodles in Tokyo alone (and I won’t even get into the books, magazines, TV shows, and movies dedicated to this dish). I have to wonder, with all the hype and so many different gourmet versions of the brothy noodles, is there such a thing as the perfect bowl of ramen noodles? My answer: absolutely, and I will happily keep searching until I find it.